Gilbert Hall opened in 2009 alongside Burlingham Hall. Designed for students that are 19 years old or older prior to the start of the Fall term or have fulfilled one-year of the University's two-year residency requirement. Gilbert is a residence hall featuring four and six-person apartments, as well as three and four-person suites. Units have bedrooms, bathrooms and kitchens or kitchenettes, and the hall also features shared community spaces. Gilbert also features energy-efficient design and an indoor bike storage room. Gilbert Hall is located on the North side of campus west of the Vandervelden Court complex. 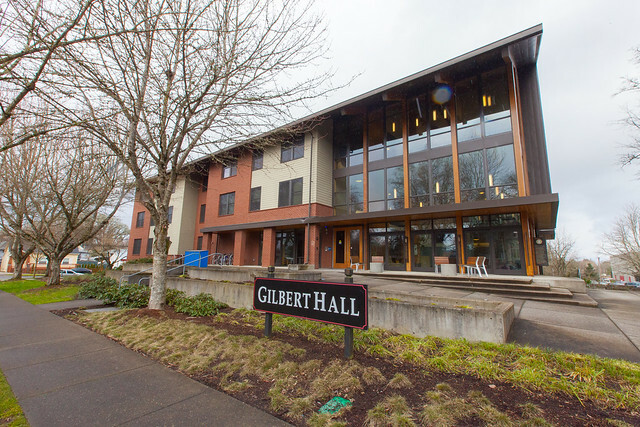 Living in Gilbert Hall gives students a sense of community while also giving the student the positive aspects of independent living. This building houses students that are 19 years old or older prior to the start of the Fall term or have fulfilled one-year of the University's two-year residency requirement. Each apartment has two double bedrooms and two single bedrooms. The full size kitchen with breakfast bar is open to the living room. The two bathrooms each have a tub/ shower combination with access to one shared sink/vanity area. Large mirrors and modern lighting are located at the sink/vanity. Each bedroom has individual closet space and the apartment has at least one additional shared storage closet. Each apartment has four single bedrooms and two full bathrooms, and a full size kitchen with breakfast bar is open to the living room. The two bathrooms each have a tub/ shower combination with access to one shared sink/vanity area. Large mirrors and modern lighting are located at the sink/vanity. Each bedroom has individual closet space and the apartment has at least one additional shared storage closet. Each apartment has two double bedrooms and two full bathrooms, and a full size kitchen with breakfast bar is open to the living room. The two bathrooms each have a tub/ shower combination with access to one shared sink/vanity area. Large mirrors and modern lighting are located at the sink/vanity. Each bedroom has individual closet space and the apartment has at least one additional shared storage closet. Each suite has two double bedrooms, two full bathrooms and one open shared living area and small kitchenette (includes a microwave, mini frig, sink, counter space and cabinets). Each bedroom has two separate closets within the room. The bathrooms have a tub/shower combination with access to a shared sink/vanity area. Large mirrors and modern lighting are located at each vanity. Each suite has one double bedroom and one single RA room with two full bathrooms and one open shared living area and small kitchenette (includes a microwave, mini frig, sink, counter space and cabinets). Each unit has one bathroom for the double rooms and one bathroom for the RA each with separate sink/vanity areas. Large mirrors and modern lighting are located at each vanity. Each bedroom has two separate closets. All rooms are ADA adaptable. Recycled materials in concrete, steel, insulation and drywall.